April sure snuck up on us fast; we meant to post an April Fools Barn on the First but instead here we are, several days late and a barn short! So April’s Barn of the Month is the Decatur Log Barn simply because we know so little about it and want to appeal to our viewership to know more. 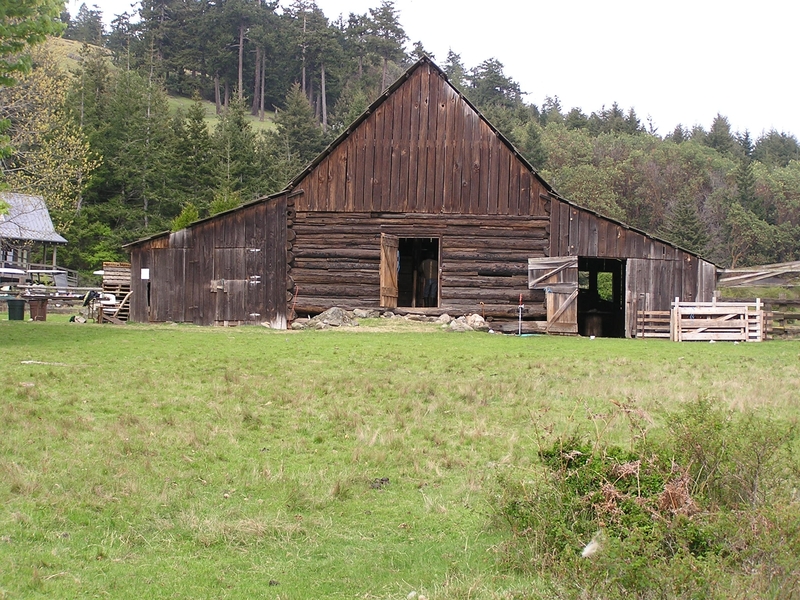 This barn has been used in the past for sheep shearing, and we are indebted to participants in the event for the few photographs that we have of it! Log barns–the first built because of the availability of timber–are rare in the islands ; this one on Decatur is one of only two that we know of! The length of the logs limits the size of the barn: this structure is estimated at 28′ wide by 34′ long. The bottom logs either were laid directly on the ground or were placed on cedar stumps or field stone. The builders peeled the bark off the logs but kept them rounded (i.e., did not hew them flat, as they did with many log dwellings in the islands), and fitted them at the corners with what appears to be saddle notching. Logs were often burnt to provide a protective layer to prevent insect infestation. Irregular strips of lumber–scantling–were used to cover the gaps between the logs. The framing of the roof, as well as the sheds on either side, is constructed of poles and covered with cedar shingle roofing and sawn board siding. If you know more about the particular history of this barn, we’d like to hear from you!